Meet your guide at the corner of Royal and Conti Streets in the French Quarter 30 minutes prior to tour to start your voodoo and cemetery walking tour of New Orleans. As you stroll through the streets of the French Quarter, learn about New Orleans history and the classic architecture around the city. Walk by shotgun homes — one of the most popular styles of Southern homes in the early 1860s — as well as Creole townhouses. Along the way, hear more about the city’s legendary voodoo practitioners such as Marie Laveau. Many New Orleans residents believe in the religion, and various ancient traditions and rituals are still observed. 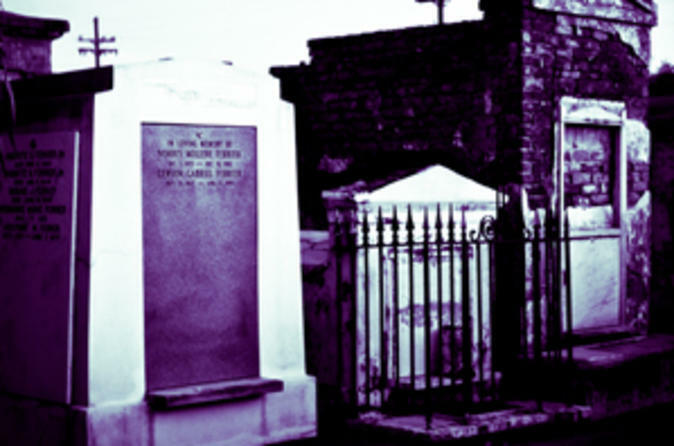 From there, make your way to St Louis Cemetery No 1, where you can see Marie Laveau’s burial site and above-ground tombs. Your guide shares why above-ground burials are common in New Orleans as you meander through the labyrinth of graves to find Marie Laveau’s tomb. People come from all over the world to leave offerings, pay their respects, pray, and perform rituals around her decorated grave. Once you leave the cemetery, head to the old train station, which is now a visitor center, to take a quick break before going to Louis Armstrong Park (formerly Congo Square). Your guide shares stories of large gatherings that took place here in the 1800s, including voodoo rituals. Please note: Expect to walk at a leisurely pace and cover about one mile during your 2-hour tour. Comfortable walking shoes and water bottles are recommended. Special Offer - Book and save 54% compared to the local supplier's prices! - Book Now!